Karuturi Global Ltd (BSE: 531687, NSE: KGL) has announced its consolidated results for third-quarter of FY‘12. On a consolidated basis, Karuturi Global clocked a revenue of Rs. 142.43 crore in Q3, which is 11.50% lower than the corresponding Q3 in FY’11. Consolidated net profit is also down from Rs. 45.01 crore in Q3 FY’11 to Rs. 42.51 crore now, down by 5.55%. 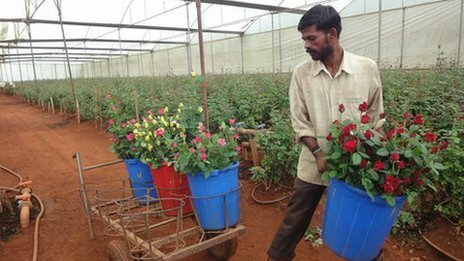 The results were surprisingly weak, as traditionally, Q3 tends to be a strong quarter for Karuturi Global due to the buoyancy of the Christmas season for this floriculture major. This is for the first time in the last four financial years that Karuturi’s Q3 profit has fallen year-on-year. And consolidated Q3 revenue has not fallen year-on-year for at least the last five fiscals. On a quarter-on-quarter basis, however, KGL’s revenue has shown an up-tick of 6.51%. The QoQ growth in profit (before exceptional items and tax) is even better at 28.87%. Net profit can’t be properly compared on a QoQ basis, as during the second quarter, Karuturi Global had incurred an exceptional expense of Rs. 14.37 crore due to crop and equipment loss due to floods in its Ethiopian agricultural foray. The sequential up-tick in both revenue and profit shows that Karuturi Global is trying to stand up on its feet now after falling down badly in Q1 & Q2, when both revenues and operating profit plunged from the good performance in Q4 of FY’11. However, investors who were expecting Karuturi to be jumping up and running already due to the Christmas season were in for a disappointment as the year-on-year results shows. Coming to the fiscal year-to-date performance or the nine-monthly results, revenue has fallen by 7.54% and profit (before exceptional items and tax) has dropped by 12.52%. Operating Profit Margin (OPM) has gone down to 24.60% from the corresponding nine-month period’s 27.64%, signalling that there is pressure on margins as well as volumes in Karuturi Global’s core cut rose business. Though a modest revenue as well as profit was expected from the agricultural operation in the Bako region of Ethiopia, it is not seen in the result. KGL’s standalone results this time is exceptionally weak, both in revenue and profit, and both on a year-on-year and quarter-on-quarter basis. This is rather surprising given the impact of rupee weakening during the quarter. Karuturi’s auditors in their limited review of the Q3 result has noted that the company has been served an assessment order by Income Tax Department for additional income tax and interest of Rs. 83.50 crore for the assessment year 2008-09. Though Karuturi Global has filed an appeal before the appellate authority, the auditor has remarked that the company has neither made a provision for this demand nor disclosed this as a contingent liability in the quarterly accounts. At the current profit run rate, the demand from the IT Department amounts to nearly two quarters’ net profit, and as such, is a significant development.